An open conversation with the members of Kumbia Queers and Que Bajo regarding cumbia, gender and love in Latin America. Followed by an acoustic set by the Kumbia Queers. America is a continent marked by migration of bodies, ideas and ideals. It is a region politically divided into countries named and formed by Europeans, mostly man, mostly white or after gold. The vast richness of the continent has attracted people from all over the world for centuries, making it difficult to establish an identity that we can call our own. How does culture shape what we believe, see and hear? Cumbia began as a slave movement in the Caribbean, and has recently been redefined and reseen by independent musicians across the world. The Kumbia Queers, Gecko Jones and Uprooot Andy are part of this redefinition. But music is not only music, it implies politics, divisions, and struggles. The Kumbia Queers are the first band in Latin America to produce love songs from girls to girls, and the first openly queer band in the masculine domintated punk-rock scene. This has allowed a redefinition of gender, sexuality, and love as political action. Through this off track academic presentation, we intend to discuss contemporary Latin American and American issues like womanhood, gender, and slavery. 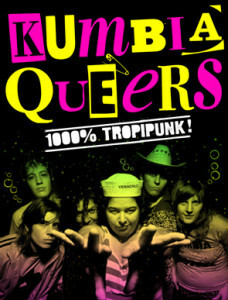 Kumbia Queers are a group of cumbia-punk-rockers that started eight years ago in Argentina. It formed in the underground circles of Argentina, and is formed by independent punk-inspired artists. The group has become an international phenommenon that has led them to growing tours in Europe and the Americas; an edition of their first album in Japan; a documentary film to be released in Chile, and other international presentations in major festivals like Fusion (Germany) and Vive Latino (México). The seven girls that make up Kumbia Queers are also involved in other bands, and independent art movements across the world. Gecko Jones and Uproot Andy are celebrated internationally for their cumbia production in New York. They are all part of the cultural shift provoked by the redefinition of cumbia. They have hosted Que Bajo for 5 years, a series of parties in New York hosting diverse musicians from Latin America, Africa and other regions of the world. Santo Padre is a Mexican queerist who develops inter-American projects that allow dialogue, in hopes of democracy and freedom. She is the co-founder of agite y sirva, the traveling videodance film festival in Mexico, and is currently an honorary member of La Pocha Nostra, the performance group founded and directed by Guillermo Gomez Peña. This program is part of Queens Museum’s Artists Services program, Open A.I.R. It is made possible by a generous grant from The Scherman Foundation’s Katharine S. and Axel G. Rosin Fund. Public Events at the Queens Museum are supported in part by The Kresge Foundation, Surdna Foundation, and The David Rockefeller Fund. Additional support provided by the New York City Department of Cultural Affairs and New York State Council on the Arts with the support of Governor Andrew Cuomo and the New York State Legislature. Founded in 2008 by Uproot Andy and Geko Jones, the NYC tropical dance party Que Bajo has been influential in changing the sound NYC nightlife. The residents’ now widely known remixes and productions mix the folkloric music of Latin America with modern electronica. Initially intended as an outlet for this new sound (often known as Tropical Bass), Que Bajo has increasingly become a showcase for an ever evolving array of new musical trends emanating from around the globe. Nominated for ‘Best Party’ in the 2010 Paper Magazine Nightlife Awards and named by Timeout NY as NYC’s Top Latin Underground Party, Que Bajo continues to host many of the young artists and DJs on the cutting edge of these new sounds. 2013 saw the launch of Que Bajo Records releasing a steady stream of remixes and club edits that give the now famous party its signature sound.